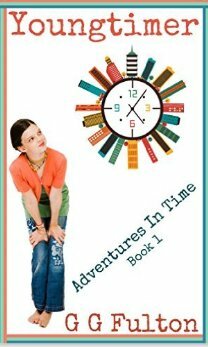 First book in a series of middle grade time travel adventures. Carly is a twelve year old sixth grader who is very bright. So bright that her school is determined to skip her two grades. When Carly gets wind of this, she comes up with an ingenious plan to prevent that from happening. Her scheme includes bribing a fellow student to pretend to be her boyfriend by doing his homework for him, and slacking off in school assignments so that she appears to be a love sick preteen incapable of earning her teacher’s trust and unenviable nerd status. In terms of everyday life, Carly and her best friend Patti are pretty ordinary. Carly is very close to her grandpa who is a bit of an eccentric because he spends lots of time locked up in his workshop. When her grandfather unexpectedly passes away, he leaves her a box of instructions with a letter. He tells Carly not to open the box until she turns eighteen. Patti convinces her to give in to curiosity. After all, who can possibly wait six years, an eternity in a twelve year old’s life. Now Carly often acts first and thinks second. That will lead the friends into trouble when they start experimenting with using the time machine locked in grandpa’s garage. The friends go back in time to visit a One Direction concert, the filming of their favorite movie on the island of Santorini, and visiting a school bully named Lulu, with unexpected consequences each time. But Carly receives her biggest scare when she attempts to go back in time to prevent her parents from meeting. What was she thinking? Now her life as she knows it won’t exist. Readers in the middle grades will love the strengths and flaws in both the children and adult characters in this series. Targeted for grades four through eight, boys and girls will find a lot of familiar problems and situations. Good book for classroom discussion. I look forward to examining other books in the series. An intriguing urban fantasy tale that will appeal to young adult and adult audiences, but one that might be enjoyed by children as young as ten who will “grow into” the meaning of these fantasies as they mature. Fourteen year old Sam has just received a bad report card. On Saturdays, he has a ritual of accompanying his mother to her job in an antique store on 80th street in Manhattan. Once there, he leaves to spend the day walking down to the twin towers in Lower Manhattan and back again. As they leave their apartment, Sam ponders how to break the bad news. He places the report card on the console after they cross the Brooklyn Bridge. Little does he know that he will experience an adventure that changes his life on his walk today. Sam will meet a homeless man named Elijah who asks Sam for his shoes. Subsequently, they will encounter a bicycle messenger a human antenna, a talking train, spirits of artists in the Metropolitan Museum , a princess cloud and many others. The streets of Manhattan are transformed into a water paradise filled with lush vegetation. What does it all mean? Will anyone else believe Sam’s story? Does the experience have a impact on Sam’s future? The adventure is magical on several levels. 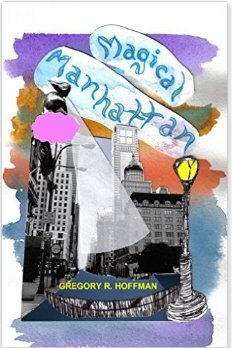 It is a wonderful walking tour of Manhattan; the author expertly captures the essence and spirit of New York City. The imagination and allegories presented by the author to the reader as food for thought have many layers of meaning. Clever and creative with no objectionable content. This book could be used for so many topics as a classroom discussion or starter for creative writing assignments. 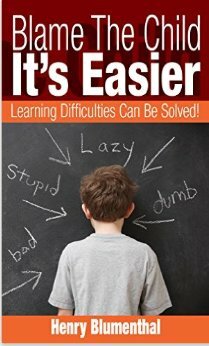 Blame the Child – It’s Easier: Learning Difficulties Can Be Solved! This book portrays a common sense approach based on the author’s lifelong experiences in education. He bases his conclusions on study and experience which dictates it is far wiser to withhold blame and take an objective and realistic approach to the difficulties manifested in the learning process. Student victims are often stressed because of the undue pressures placed upon them by parents, teachers and other students. 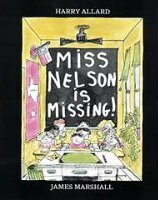 The author attempts to explore flaws in the educational system, parents and supporting personnel. There are many reasons why a student falls behind, excessive absence, changing schools, peer pressure, and poor foundation in basic learning concepts. The system often finds it easier to do a complete psychological testing rather than allow the teacher to discover a particular educational diagnosis of a specific weakness that can be easily remedied. Some teachers move too quickly, teach only in large groups, and do not allow for individual differences. Placed under stress by school districts, teachers feel compelled to cover everything in the curriculum rather than ensuring a firm foundation for future learning. Understanding rather than memorization should be the goal. Teachers need to acknowledge that they too have weaknesses. Rather than fall into the trap of labeling and treating with medication, they should investigate possible symptoms of learning problems. Blumenthal provides teachers with suggestions for teaching as well as hints for parents. He explores new ways of testing, approaches to curriculum and suggestions for incorporating good nutrition in successful learning environments, as well as productive ways to assess successful teaching. Instead of blaming, parents, students, teachers, and medical personnel can share in their success. I produce a local access TV show, THE WRITER’S DREAM. I interview local authors regarding how they write, publish and market their books. It’s pretty impressive how many different ideas arise to create the books featured on the show. I’ll share some of the things that make me proud to be an author. For instance, most of the authors I interview never planned on writing and publishing their works. Some say they’ve always written. Most have no formal training as writers. A fair number work or worked in the publishing industry. Bob is pretty much your average fourth grader. His father is a teacher at his school; that can be a problem. Lately, he has been having bad dreams that keep him up at night. His mother has a solution; she gives him a dream catcher and explains that his dreams will be trapped there and no longer keep him awake. Bob is astonished when a red furry monster named Boris materializes out of the dream catcher. Boris will answer Bob’s call whenever he needs help. Turns out Boris can help him with homework and bullies who pick on Bob at school. How can Bob explain Boris when no one else can see this little furry friend? 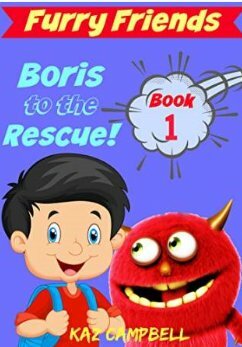 The comical adventures of Bob and Boris cover topics important to elementary school children like fitting in at school, bullying and parental relationships. Book can best be described as an early chapter book. There are a few digital illustrations randomly added to provide support for early readers. First in a series. Recommended especially for ages six through eight. 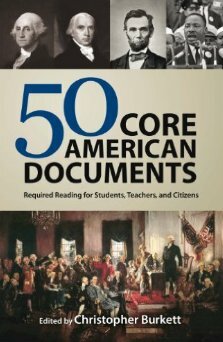 A valuable collection of primary sources for anyone who wishes to truly understand the evolution of American history and government. The core documents upon which the American republic is founded include the Declaration of Independence, The Constitution, and Bill of Rights provide readers with the framework. Of course there were differing views aptly displayed in the Memorial and Remonstrance Against Religious Assessments, the Virginia Statute for Religious Freedom, Notes on the Debates held in the Federal Convention of 1787 as well as samples from the Federalist and Anti-Federalist Papers. Opinion letters from statesmen like Andrew Jackson, Alexander Hamilton and Thomas Jefferson present private viewpoints. Landmark cases heard in the Supreme Court give insight as to the evolution of government as seen from the highest court in the land. 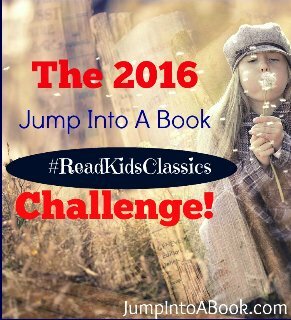 Marbury vs. Madison, Dred Scott vs. Sandford, Plessy vs. Ferguson and Brown vs. The Board of Education are among them. Foreign policy touchstones like the Monroe Doctrine, New Nationalism Speech and A Time for Choosing demonstrate debates over foreign policy. Human rights are discussed by Frederick Douglas and John C. Calhoun, Martin Luther King, Jr. and Lyndon Johnson. Milestone documents include the Emancipation Proclamation, the Gettysburg Address and the “I Have a Dream” speech. While by no means exhaustive, this well organized collection of historic documents that are keystones of American history are a valuable reference resource for students of history, teachers and librarians. Appropriate for ages ten and older. Put this one on your reference shelf or homeschooling curriculum. If you enjoyed reading this post, please subscribe by clicking on the word Follow or by hitting the RSS FEED button in the right hand corner of this page.